Homeprint is run by John Brebner who has been making Artist’s Books with his wife, Allison, since 1974. John has worked as a teacher and Art Specialist in the education system for 34 years and during this time Homeprint has published over 100 titles. Most of these are on view at the Alexander Turnbull National Library, Wellington. Homeprint has also exhibited books in Germany, Spain, France and South Korea over the last 20 years. 1 – 5-day residencies, including accommodation at our studio. This covers the techniques below appropriate to your project with unlimited studio time Price: $1000 (incl GST). 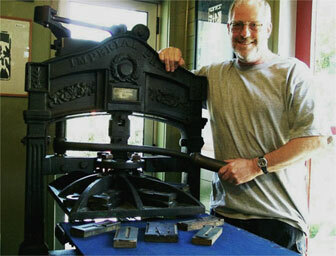 Classes are based around Homeprint’s large collection of vintage working presses and equipment. Please contact John to discuss further about the type of course you wish to attend and possible dates.